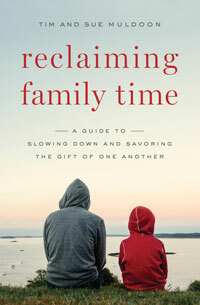 Tim and Sue Muldoon are the parents of three children and the authors of Six Sacred Rules for Families. Tim is a theologian and professor who has taught at Boston College and Mount Aloysius College. Among his many books is the popular The Ignatian Workout. Sue is a therapist and religious educator who has worked in the clinical, collegiate, and parish settings, most recently as director of family ministries at Good Shepherd Parish in Wayland, Massachusetts. What happens when our lives spin out of control because we are so busy and overcommitted? The negative consequences of such a lifestyle are well known, but few of us are able to put on the brakes so that we can truly enjoy the gift of one another. Tim and Sue Muldoon help us experience the peace that only God can give, and they also share what has and hasn't worked in their own family.